World economies are increasingly driven by knowledge and information; the effects of globalization require greater civic engagement and cultural literacy. Postsecondary education remains the best way for civic actors to equip themselves with the knowledge and skills needed to succeed in our evolving global landscape. Launched in 2009, the Big Goal sought to spur a college attainment rate of 60% in America by 2025. Although modest progress has been made, the US continues to lag behind other industrialized countries and the majority of college graduates are from privileged backgrounds. While 70% of jobs in Michigan now require training beyond high school, the state lags behind the nation’s average for college attainment and fewer than a quarter of the state’s high school graduates are college-ready. We must do better. 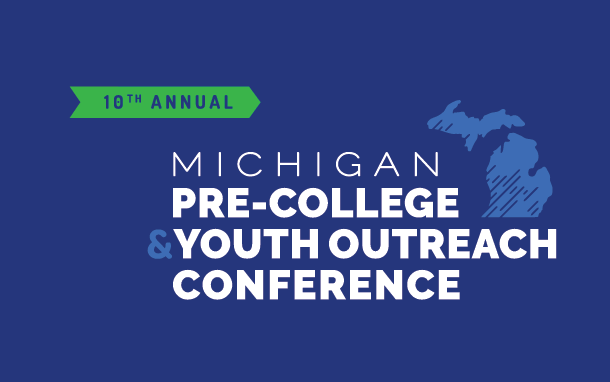 At the Michigan Pre-College and Youth Outreach Conference, we will examine challenges to postsecondary attainment and explore opportunities to address them. Increasing access to postsecondary opportunities for low-income, first-generation and underrepresented college students will benefit the state and our nation. Scholars, researchers, and practitioners will demonstrate the impact of promising approaches to inform, engage and inspire Michigan’s youth to pursue postsecondary education. Together, we can address The Urgency of College Access.